In recent years the increased use of drifting fish aggregating devices (dFADs), particularly in industrial tuna fisheries, has led to attention on the fate of this equipment at the end of its useful life. Concerns around dFADs include their contribution to over-fishing, bycatch, and effects on fish behaviour. Additionally, dFADs can attract non-target species, such as sharks and turtles, that become entangled and killed in the dFAD netting and rafts. When lost or abandoned, such entanglements can continue unabated and dFADs can drift into and damage sensitive nearshore habitats, such as coral reefs. At the same time, Pacific Island nations are investing in nearshore anchored (a)FADs as they strive to improve the supply of nutritious food for their citizens. These aFADs are designed to provide artisanal fishers with access to harvest pelagic species close to shore. While aFADs are designed to remain in place with anchors, it is not uncommon for them to break free of their anchors and drift, with the potential to cause similar negative impacts as dFADs. 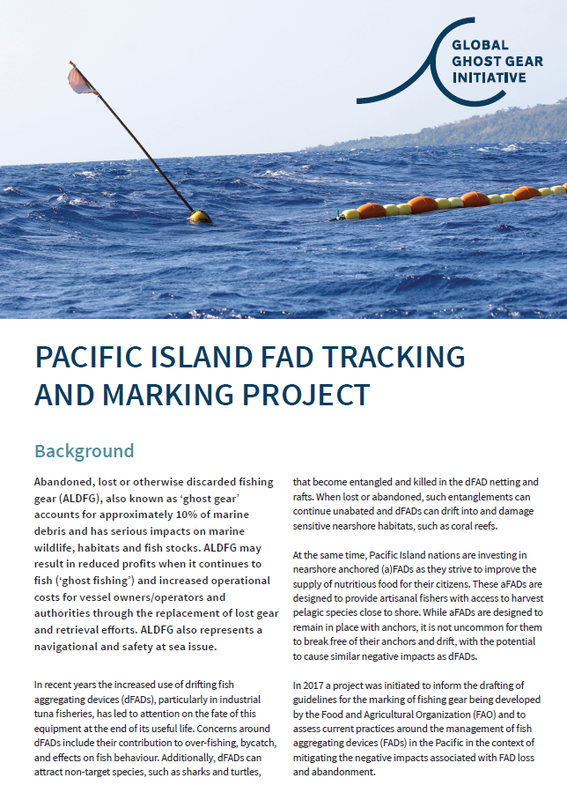 In 2017 a project was initiated to inform the drafting of guidelines for the marking of fishing gear being developed by the Food and Agricultural Organization of the United Nations (FAO) and to assess current practices around the management of fish aggregating devices (FADs) in the Pacific in the context of mitigating the negative impacts associated with FAD loss and abandonment. This project was funded by the Belgian government and consists of two tracks: one track partnering with a commercial tuna fishing company operating in the Pacific; and one track partnering with the Vanuatu Fisheries Department. Work with a commercial tuna company to assess their current dFAD management practices against the FAO’s Draft Guidelines on the Marking of Fishing Gear and the Global Ghost Gear Initiative (GGGI) Best Practice Framework (BPF) for the Management of Fishing Gear. Trial low-cost methods for marking and tracking artisanal aFADs and enhance technical understanding in an artisanal fishery for how fishing gears can be marked and / or tracked. Explore the feasibility for the responsible disposal, retrieval and potentially recycling / re-use of end of life FADs. The tuna company we worked with manages two tuna fishing fleets in the Western Central Pacific Ocean and the Eastern Tropical Pacific (ETP). While being a leader in sustainable tuna fishing practices, they face the same challenges with FAD management as all fishing companies active in the Pacific. They agreed to work with the GGGI on this project to provide an industry perspective into the development of international guidance and best practice on the management of FADs and as part of their commitment to fostering sustainable fisheries. Similar to other commercial operators, the company regularly deploys hundreds of drifting FADs per vessel, per year in the WCPO and ETP combined, and tracks their dFADs’ positions using satellite buoys. They also use aFADs in some of the areas. The company adopted a Non-Entangling dFAD policy that applies to its fleet operating in the Central Pacific. The policy committed them to transitioning all dFADs to a less entangling design, as defined by the ISSF, by April 2018. The company’s long-term goal is to transition to biodegradable FAD designs. They are trialing biodegradable dFADs in the Pacific in 2018 as part of their involvement in the TUNACONS ETP Fishery Improvement Project. As part of the project the company transferred ‘ownership’ to GGGI of satellite buoys they were no longer tracking for the duration of the project. The buoys were monitored and mapped to identify movements and to assess length of time from deployment to beaching or loss of satellite signal. Results were provided to them to inform FAD management decisions. 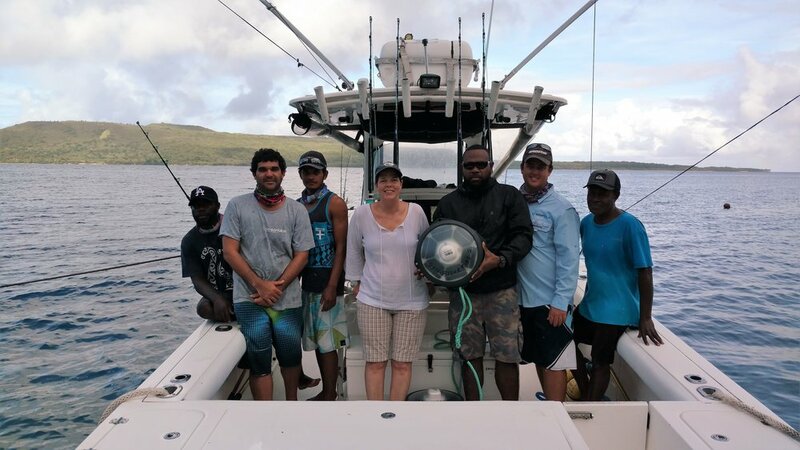 The track with the Vanuatu Fisheries Department (VFD) involves researching and testing cost-effective methods to track the position of aFADs so they can be retrieved if they break free from their anchors. The project has also been exploring how the current approaches to managing aFADs aligns with the FAO’s guidance on gear marking and the GGGI Best Practice Framework for the Management of Fishing Gear (BPF). 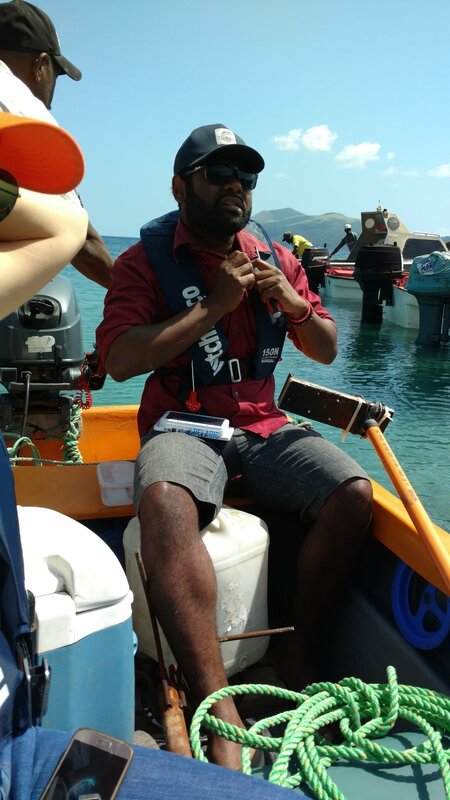 GGGI Participant Pelagic Data Systems (PDS) tracking devices were selected and tested on VFD aFADs. These devices are low-cost, small and light, run on solar power, and transmit position data over the cellular network. SatLink satellite buoys with echo sounders were also employed to validate PDS position tracking and to assist VFD in assessing aggregation effectiveness of selected aFADs to inform future management decisions related to aFAD deployments. Preliminary results indicate that PDS devices can provide accurate, real time position data in Vanuatu adequate to find an aFAD when lost, as long as the aFAD is within cellular range. Therefore, prompt deployment of retrieval vessels is important if lost aFADs are to be recovered before they drift out of cellular range. To see a more detailed case study of this project, click on the image below.